View Tameson’s pneumatic manifolds as they provide a convenient central location to mount 5/2 or 5/3-way pneumatic solenoid valves and distribute the compressed air to each valve. Having all of your pneumatic solenoid valves in one place will greatly reduce fittings and pipes, making your assembly organized. They are available in different sizes, but typically you can mount between 2 to 10 valves on a single manifold. 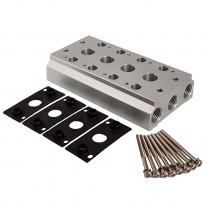 They are designed specifically for a 5/2 or 5/3-way valve and based on the manifold and valve type, the air will go through the valve top or back down through the manifold. For mounting the valves, manifolds are either brand specific or adhere to ISO 5599 or ISO 15407 standards. The air enters the manifold through the “P” port and vent out through the “R” ports and have threads to connect pipes, hoses, or fittings. If a section of a manifold is not in use, a blanking plate can be used to close it off.